Chandibjee resort is the only resort for anyone to stop for lunch while travelling from western Bhutan to eastern or central Bhutan. 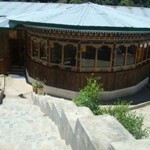 It is located right below the Trongsa-Thimphu highway on the bank of Chandijbee river at an altitude of 2400M. 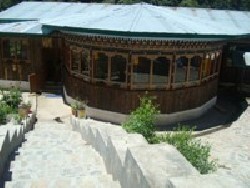 The resort is approximately 40km from Trongsa and 159km from the capital city, Thimphu. 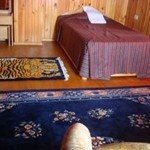 Surrounded by the lush green mountains and vegetations, the resort is one of a kind. Our restaurant serves Bhutanese delicacies and continental dishes. 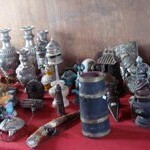 Attached to the dining room is spacious room for showcasing traditional art and craft products from where you can choose and buy the rare Bhutanese products, some of which are the art work of the proprietor himself. It is away from the noises of town where you can spend your night as we have opened accommodation facilities according to your need. Halting at the resort for a night is being lulled to sleep by the whispers of the soft breeze and the melody of the river flowing nearby.